Craving Chinese takeout, but want a home cooked meal? 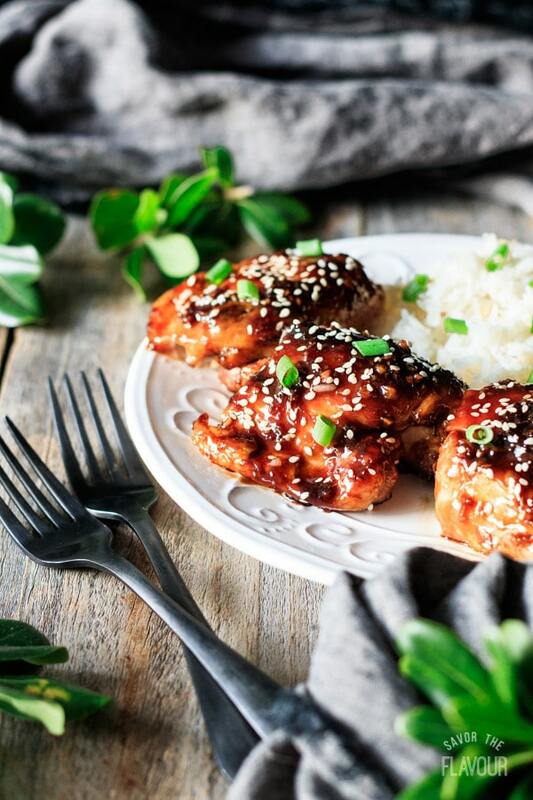 Try these sticky Asian chicken thighs. 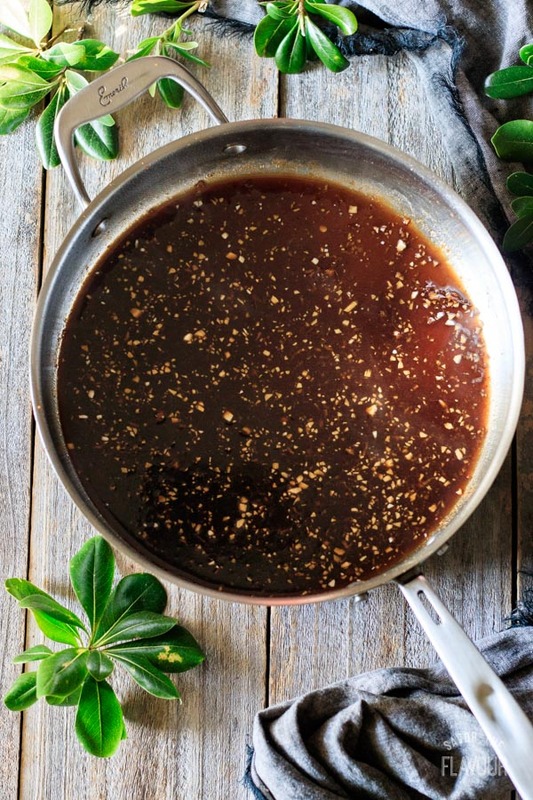 The homemade sticky and sweet sauce is finger lickin’ good and is so simple and quick to make! You’ll have gooey fingers, but who’s going to mind? This one pan weeknight meal is family friendly, and can be on the table in less than 45 minutes. 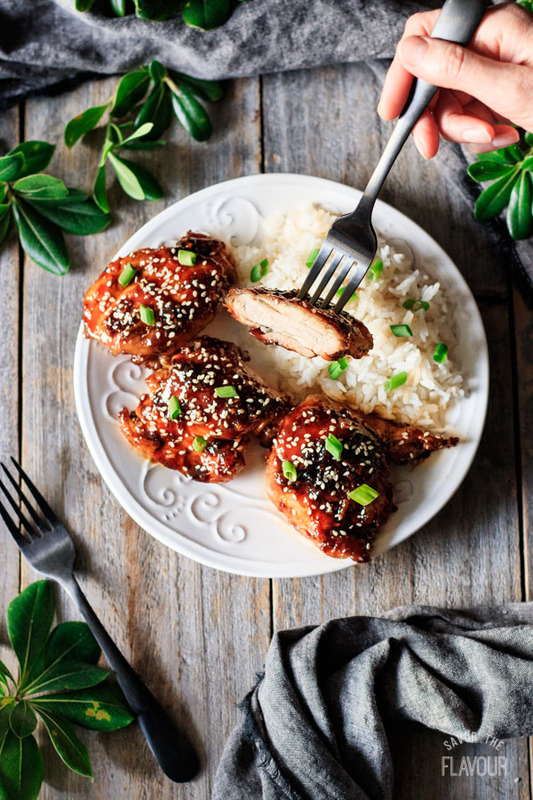 It just takes four simple steps: pan sear the chicken, cook the sauce to thicken it, spoon it over the moist juicy chicken thighs, and garnish with a sprinkle of sesame seeds and green onion. 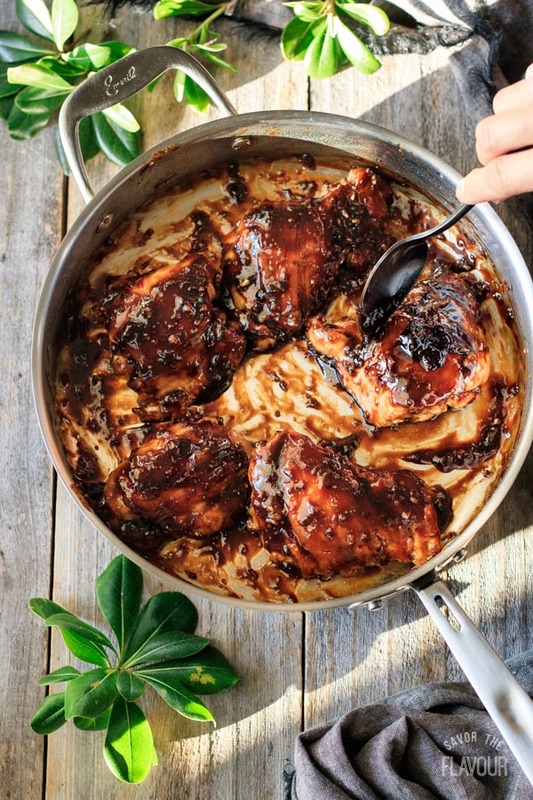 How do you sear chicken thighs? Pat the chicken dry with paper towel. 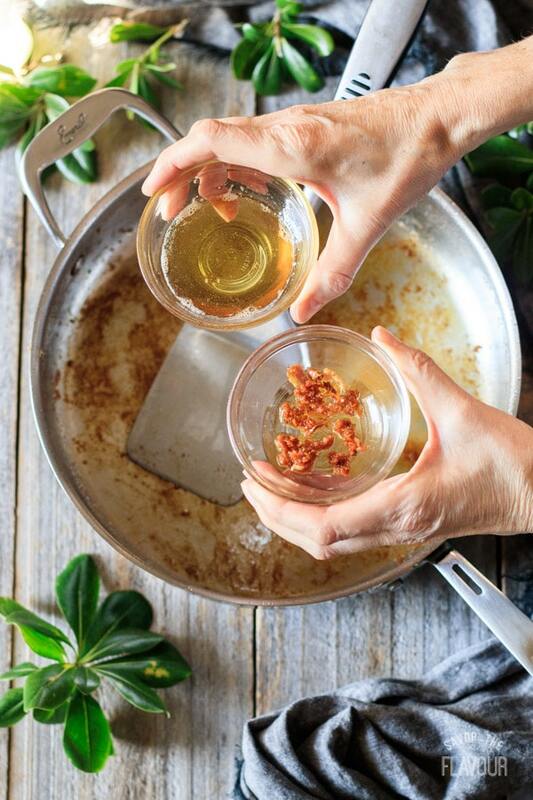 Heat oil or butter in a pan until it shimmers. When the meat hits the hot pan, the Maillard reaction occurs. See below. Lower the heat to prevent oil splatters. Turn the meat over when a crust has formed. Cook until an inserted meat thermometer reads 165 F, or juices run clear when poked with a knife. It is one of the most important flavor-producing chemical reactions in cooking. It occurs when the surface temperature is more than 300 F.
It’s a chemical reaction that happens when heat changes the amino acids (proteins) and sugar (carbs) in a food like meat. It’s different from caramelization because caramelization only involves sugars (carbs). It produces a color change to the food (browning) and hundreds of flavor compounds which will add an intense savory flavor. 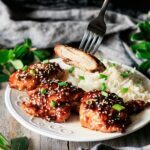 How to make sticky Asian chicken thighs. Gather all the ingredients. Mince the garlic and grate the ginger for the sticky Asian sauce. 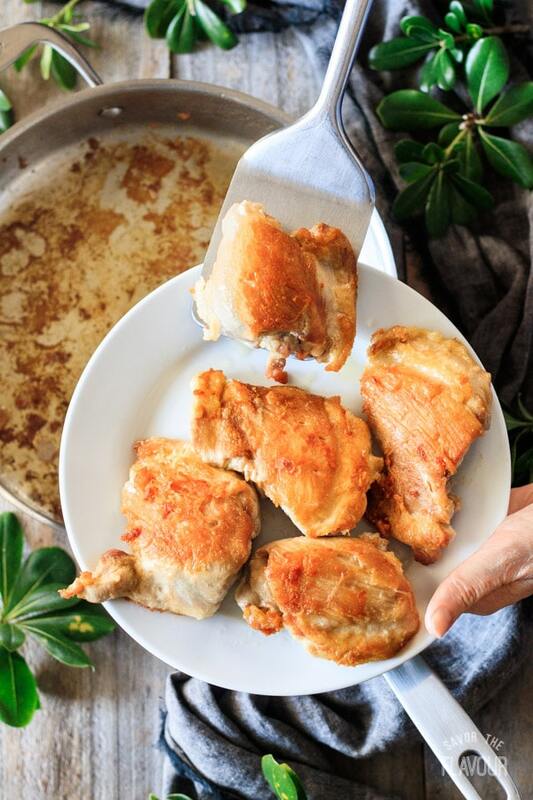 Pat dry the boneless skinless chicken thighs. 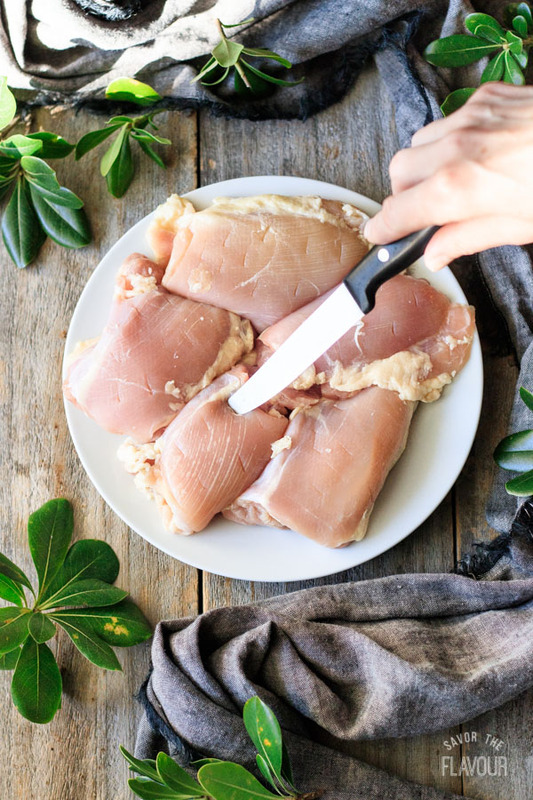 Cut slits in the chicken with a sharp knife to help the chicken absorb the sauce. If you want, you can sprinkle a little salt and pepper on both sides of the chicken while the oil heats up. Once the oil is shimmering, add the chicken thighs smooth side down. Sear the chicken for 7 to 8 minutes on one side. When it is the color you want, turn the chicken thighs over with tongs and cook until it has an internal temperature of 165 F with a meat thermometer. This should take about 7 to 8 minutes. 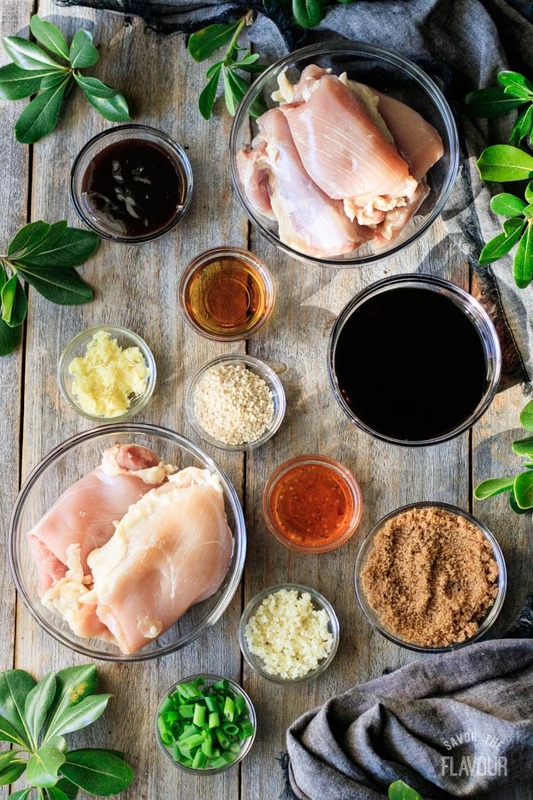 Once cooked, remove the chicken and set aside on a plate. 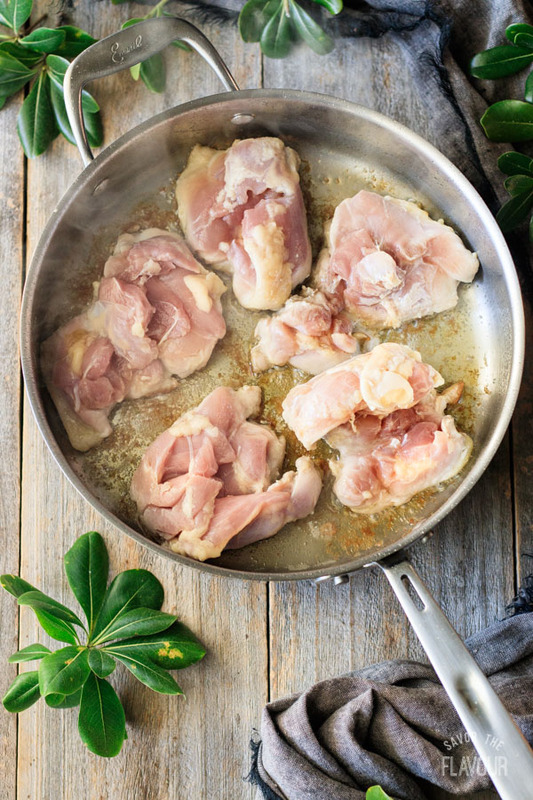 Remove the skillet from the heat and pour the chicken fat into a small bowl. Scrap the little bits of cooked meat off the pan with a flipper. 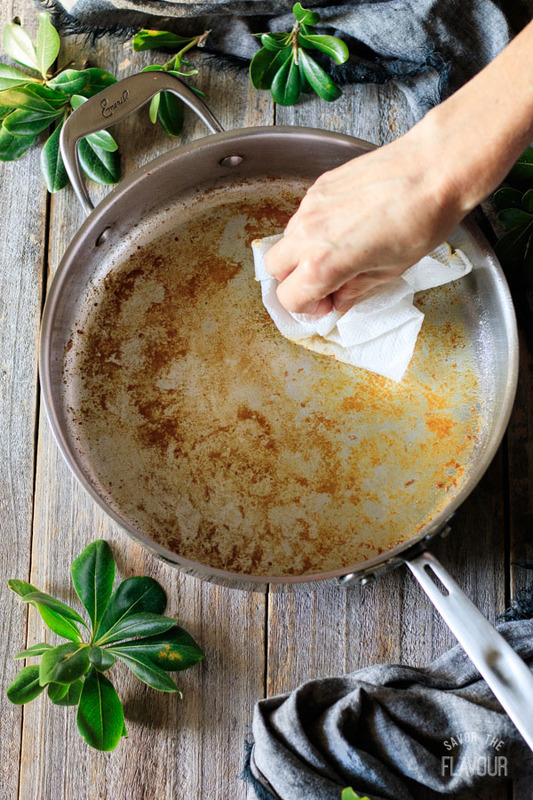 Wipe the skillet with a thick piece of paper towel to remove most of the chicken fat. Be careful not to burn yourself, as the skillet will still be hot. Pour the sticky Asian sauce into the skillet and turn the heat to medium high. Cover for one minute to bring the sauce to a boil. Remove the lid and stir constantly until the sauce is the desired thickness, roughly two minutes. Add the cooked chicken thighs back into the skillet and spoon the sauce over each piece. Garnish the chicken with a sprinkle sesame seeds. As a finishing touch, slice some green onion and sprinkle on top to add color and crunch. 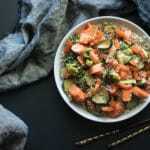 Serve hot with a side of Jasmine rice, cauliflower rice, Asian noodles, cooked vegetables, or an Asian salad. Don’t want rice? Try serving it with bok choy, steamed broccoli, or snap peas. Looking for another sweetener? Try raw honey instead of the dark brown sugar. 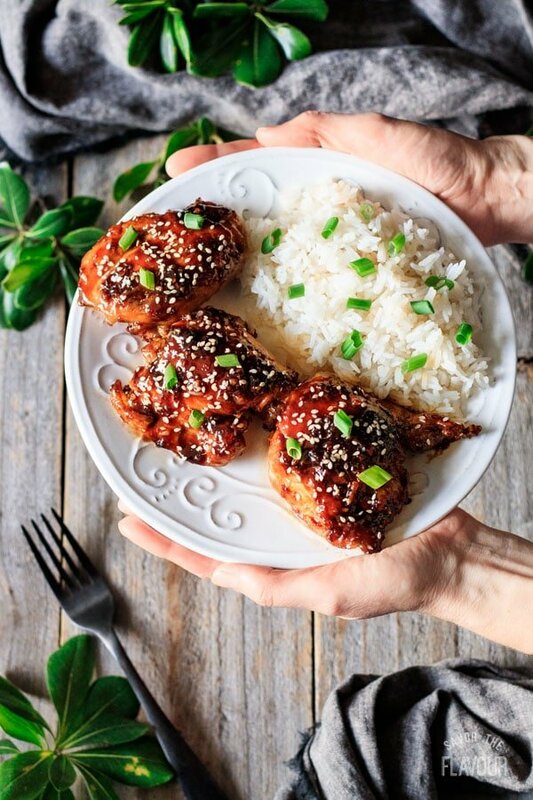 Don’t have chicken thighs? 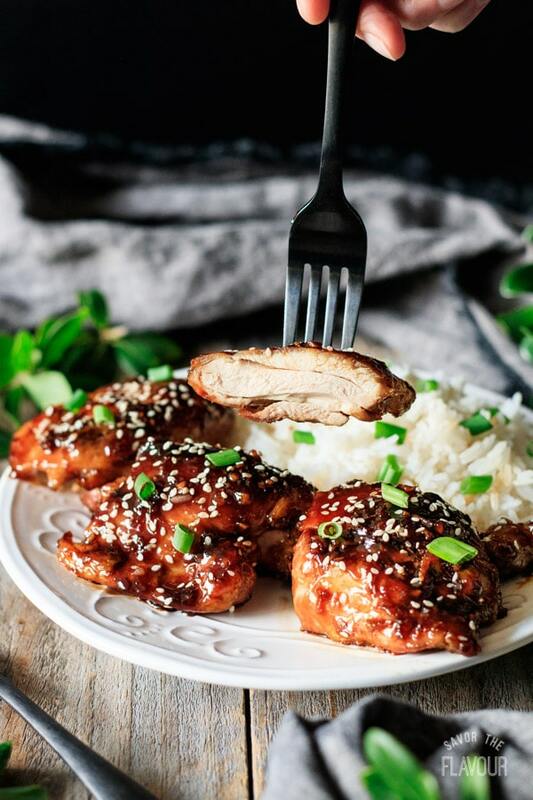 Try our sticky Asian sauce on cubed chicken or drumsticks. Make sure you pat dry the chicken thighs as browning won’t happen until the surface moisture evaporates. Like sauce on your rice? Double the sauce recipe and you’ll have plenty. 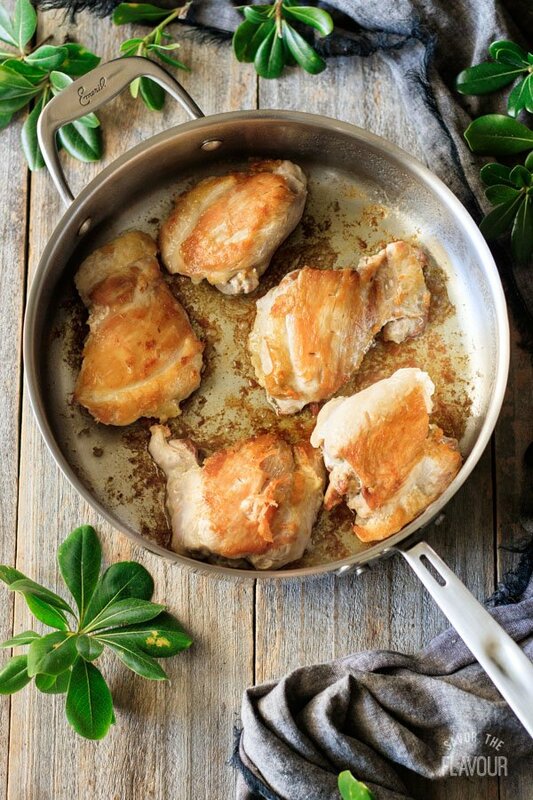 Lower the heat when searing the chicken to reduce oil splatters. If you want it spicier, add chopped red chilies. 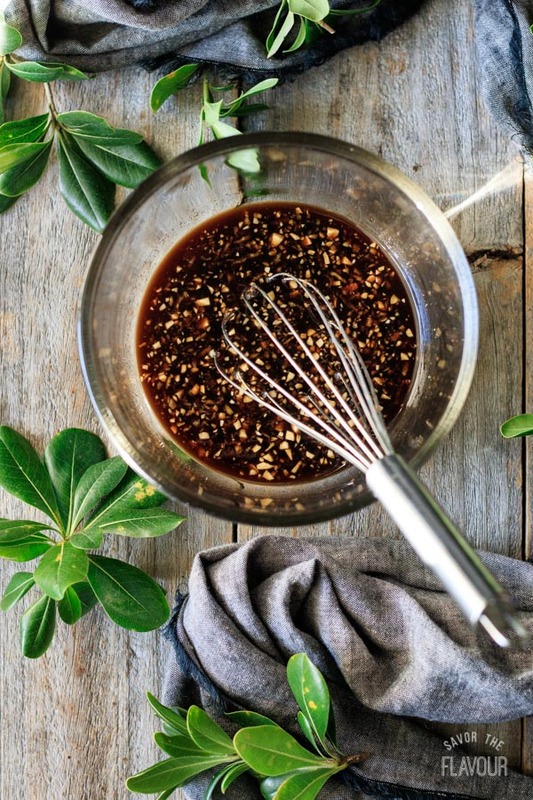 If you just want to make the sticky Asian sauce, double it and store in the fridge in an airtight container like a mason jar. 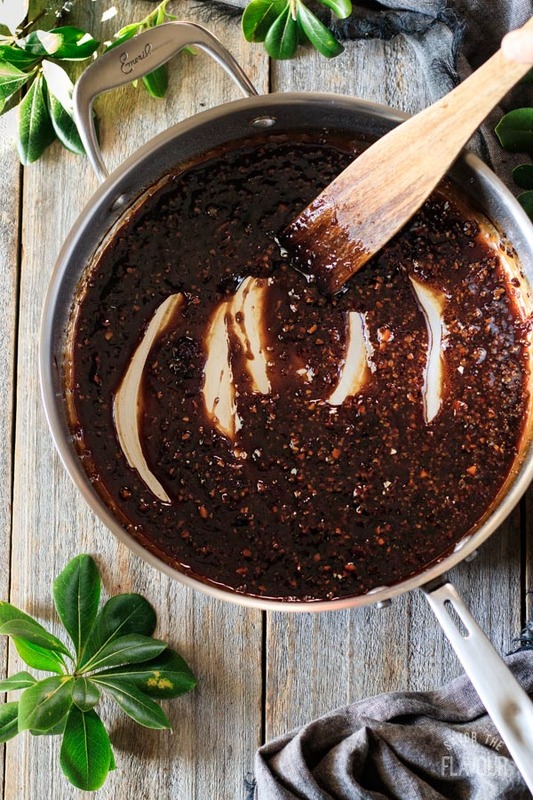 Our sticky Asian sauce with its savory and sweet taste will have you coming back for seconds. Try it for dinner tonight! 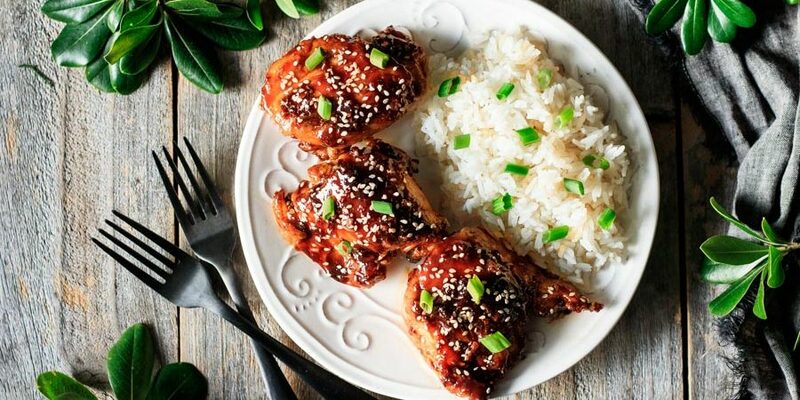 These other Asian or Polynesian recipes make a great dinner idea. 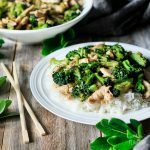 Chicken and Broccoli Stir Fry: a quick and healthy weeknight meal that can be prepped ahead of time. Orange Vegetable Stir Fry: a 45-minute vegetarian dinner that’s packed with vitamins. Polynesian Meatballs: water chestnuts give these dainty morsels a little crunch. 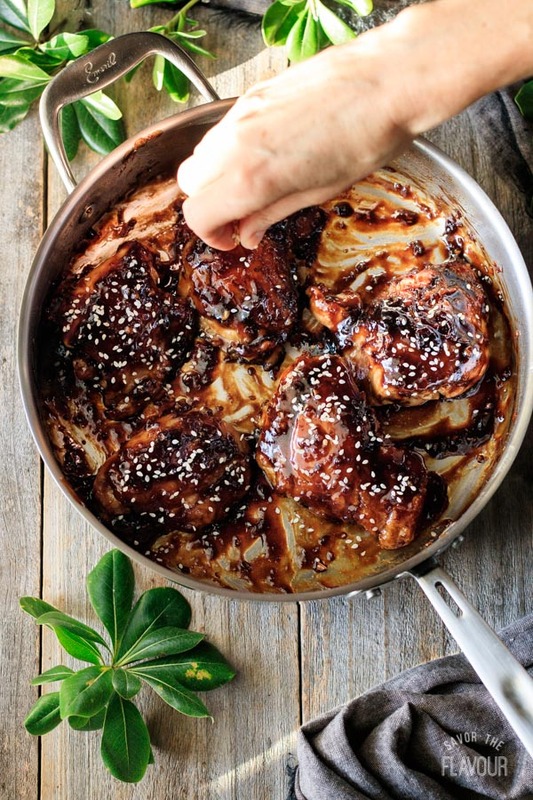 Did you make these sticky Asian chicken thighs? Please leave a star rating below the recipe to share how you enjoyed it.